Email from Diane, 10 Apr 10. 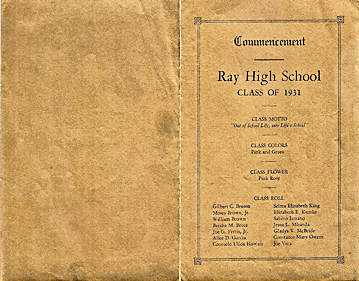 Here is the Commencement program* for Ray High School Class of 1931 found in my grandmothers belongings after her passing. My mother was born in 1931 in Ray, but my grandparents moved to Florence a few years later. Sorry I don't know any information about any of the graduates. I'd be happy for you to post the photos on your website. Thanks! 11 Apr: "....The scan just doesn't do it justice. The color of the front side is a really pretty copper color, still has some shine to it. Unfortunately it didn't transfer to the scan...."
"Out of School Life, into Life's School"
Friday, May 22, 1931-8:00 P. M.
Assembled by ovk. Last updated 04/12/2010.